Hello, I’m Jeff Miles and I love street sweepers. From a small child, I was fascinated with these machines that went up and down the streets near my home and my mother’s business in the Argentine area of Kansas City, Kansas. The lights, sounds and mechanical moving parts were magnets for me to follow as a young boy on my bicycle through our city and after our annual Silver City Day parade. As an adult, I’ve been in the sweeping industry for almost 25 years now, working for a sweeper dealership in Kansas City, Key Equipment & Supply Co. I started as a technician and today I manage all aspects of our dealership as the Branch Manager. Although our dealership is involved in multiple equipment industries, street sweeping is still near and dear to my heart. I still get the same excitement today, as I did as a child around a sweeper, when I help design, demonstrate, deliver a new sweeper and/or help a customer design a sweeping program for their needs. In 2001 I had the opportunity to help design a sweeping program and sweeper for the Kansas Speedway. 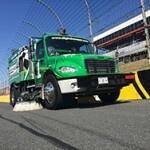 That opportunity has now grown into a long term relationship with NASCAR and Elgin Sweeper Co. becoming the Official NASCAR Green Sweeper. In 2015 I was honored to receive the NASCAR Innovation Award for my work with the program. I still help administrate the program and perform training at the annual NASCAR Safety Summit. Although it is fun having a race car blast by you at 160 MPH during a caution period, I get just as much of an adrenaline rush helping a small town municipal customer choose the right machine and/or technique to sweep their unique curb line. I’ve helped design sweepers for small/med/large municipalities, highway departments, airports, toll ways, underground caves, amusement parks, industrial sites, race tracks, etc. I’ve also helped with alternative fueled machines, waterless machines, glycol recovery machines and themed sweepers. Recently, Gideon Smith, a well respected industry colleague and publisher at North American Sweeper Magazine, reached out to me to see if I wanted to do an editorial every once in awhile. I jumped at the chance and figured I would start out with my first editorial with my personal back ground in the sweeping industry. Future editorials will include topics that I believe can make your sweeping program more productive, less expensive and most importantly….SAFER! 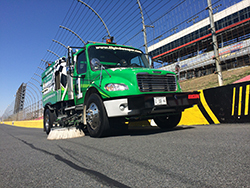 I’ll also include an occasional story from behind the wheel of the Track Sweeper where the pressure to sweep a surface can be viewed by millions of people…talk about pressure!